Being a mom of 2 boys, I have to admit, Marvel Superheroes are a pretty big deal. The obsession with Marvel Superheroes started just a few months after the obsession my boys had with matchbox cars. Every time we went out to a store, my boys would want a matchbox car… eventually after oh, say about 300 cars (seriously – I am NOT kidding!) we finally had to buy plastic buckets at Lowes to store the cars in. Have I ever told you that matchbox cars might hurt the feet a little bit more than LEGOS? Lets not even go there! Not long after the interest in cars dropped, the Superhero obsession picked up – figures were not as cheap as matchbox cars ($1 or less – please!) Eventually I tried to get creative to fulfill their interest aside from more plastic figures and capes. I sewed up Marvel Superhero Blankets at the holidays for the boys – which went over incredibly well and were ridiculously simple … then our last boys birthday was Marvel Superhero Cupcakes – I won “Mom of the Year” for that. 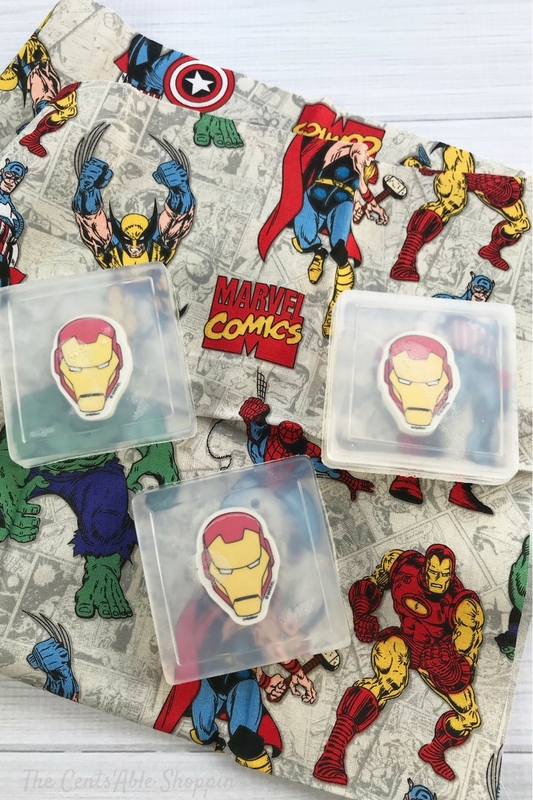 These Iron Man Soaps were a quick and easy addition to the favor bags at the birthday party and the boys seemed to love them just as much as I had hoped they would. Hopefully it will encourage them to want to shower often and thoroughly – boys, as we know, can work up a ridiculous sweat on skateboards and bikes in this Arizona heat. 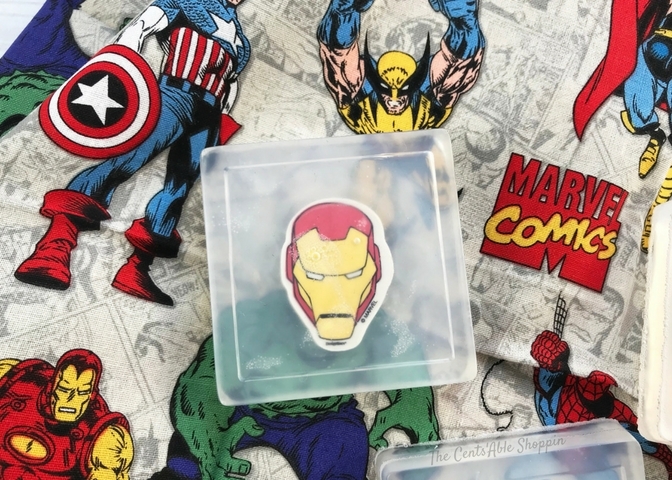 The fun thing about these soaps is that they were easy (we mentioned that), but they are totally customizable… if you are having a party for the My Little Pony fan, you can swap out the Iron Man erasers for My Little Pony. It’s totally easy. While I totally prefer and love to make cold process soaps (and I think I’m actually very talented at them!) melt and pour glycerin is totally simple to find and use, no matter what your skill level. 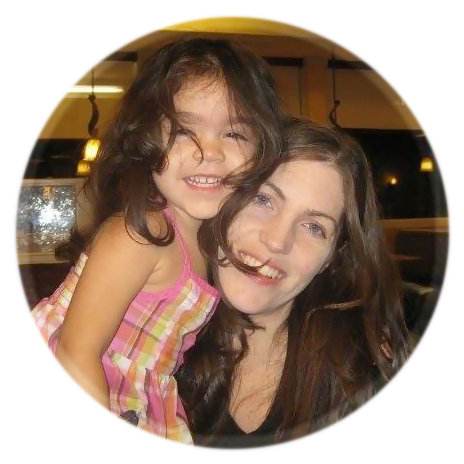 I love picking mine up at Hobby Lobby because I can use a coupon to save quite a bit .. but if you are short on time and don’t want to leave the house, Amazon delivers to your door, too. 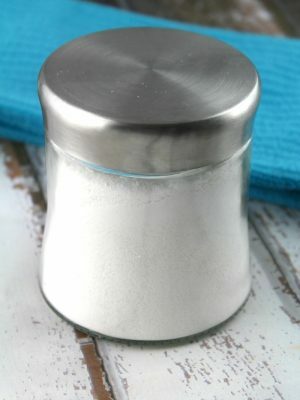 Cut the glycerin into small chunks using a sharp knife and place in a 2 cup microwave safe glass measuring cup. Microwave the glycerin in 1 minute increments, stirring until completely melted. If using essential oil, add 4-5 drops and stir. Fill each square soap mold 1/2 way with melted glycerin. 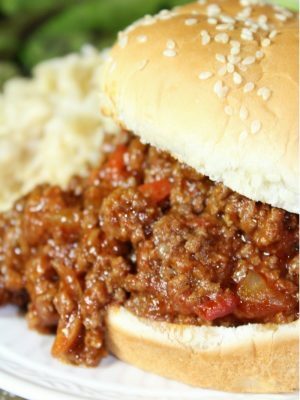 Let set for 20 minutes. 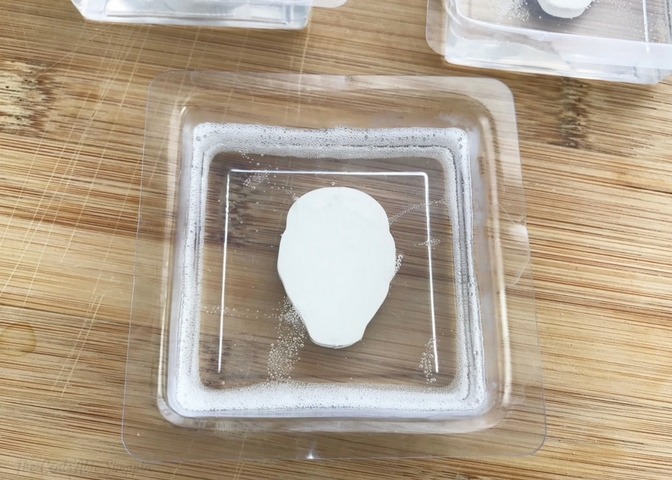 Place the Iron Man erasers face down in the soap molds on top of the set glycerin. Fill with remaining glycerin (You may need to re-melt in the microwave). Let the soap set for at least 1 hour before you gently pop out of the molds. 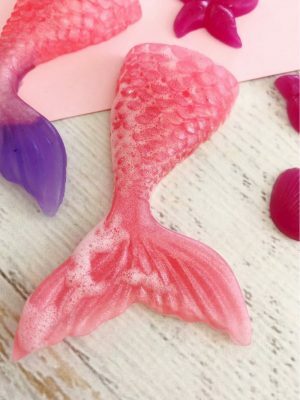 These little soaps turned out absolutely adorable! 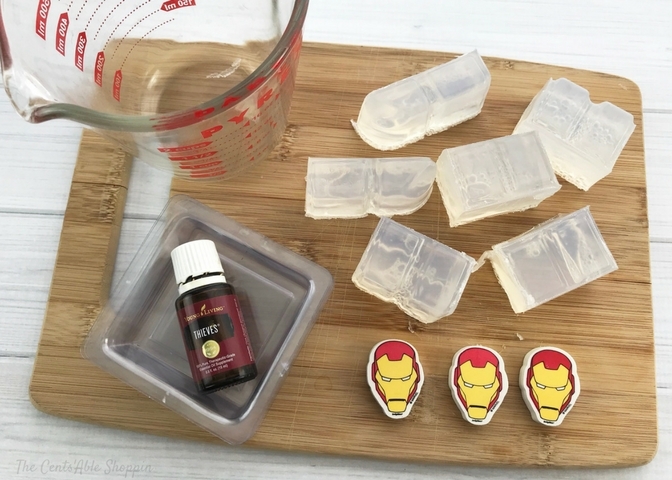 The boys thought they were AWESOME and this mamma might have just scored some cool points at the party – Iron Man Cupcakes, Iron Man Soap — they were totally all over it!